J Mol Biol. 2014; 426 (10): 2059-2069. Fribourg PF, Chami M, Sorzano CO, Gubellini F, Marabini R, Marco S, Jault JM, Lévy D.
ABC (ATP-binding cassette) membrane exporters are efflux transporters of a wide diversity of molecule across the membrane at the expense of ATP. A key issue regarding their catalytic cycle is whether or not their nucleotide-binding domains (NBDs) are physically disengaged in the resting state. To settle this controversy, we obtained structural data on BmrA, a bacterial multidrug homodimeric ABC transporter, in a membrane-embedded state. BmrA in the apostate was reconstituted in lipid bilayers forming a mixture of ring-shaped structures of 24 or 39 homodimers. Three-dimensional models of the ring-shaped structures of 24 or 39 homodimers were calculated at 2.3 nm and 2.5 nm resolution from cryo-electron microscopy, respectively. In these structures, BmrA adopts an inward-facing open conformation similar to that found in mouse P-glycoprotein structure with the NBDs separated by 3 nm. 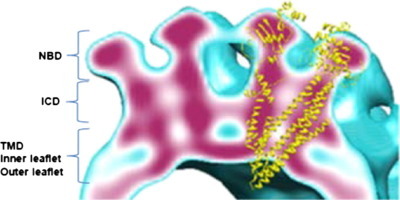 Both lipidic leaflets delimiting the transmembrane domains of BmrA were clearly resolved. In planar membrane sheets, the NBDs were even more separated. BmrA in an ATP-bound conformation was determined from two-dimensional crystals grown in the presence of ATP and vanadate. A projection map calculated at 1.6 nm resolution shows an open outward-facing conformation. Overall, the data are consistent with a mechanism of drug transport involving large conformational changes of BmrA and show that a bacterial ABC exporter can adopt at least two open inward conformations in lipid membrane.